Chemical ions - Mix and match flip cards. Various games. 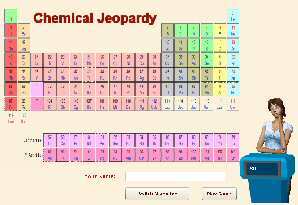 Basic chemistry - A 20 question quiz in flash. 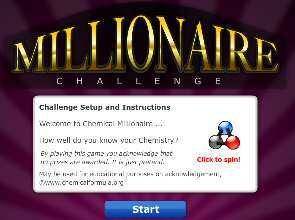 Chemical Millionaire - Flash game. 15 chemistry questions. Each level becomes harder. Who Wants to be a Chemist? - Can you make it into the Chemist's Hall of Fame? Choose your own Chemistry Avator. Each question becomes progressively more difficult. The questions are randomly drawn from a database containing 200 chemistry questions.